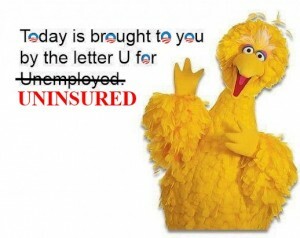 @BarackObama kills Big Bird’s health care. In a letter sent last week to President Obama, U.S. Rep. Mike Fitzpatrick contended that the Affordable Care Act had caused Sesame Place, one of Bucks County’s biggest tourist attractions, to terminate health benefits for its part-time employees. “This law is hurting real people in my district and around the country,” the Bucks County Republican wrote. A spokesman for SeaWorld, the amusement park’s parent company, confirmed Wednesday that the company was cutting the weekly work limit for part-time employees from 32 to 28 hours. Under the Affordable Care Act, companies can face fines if they do not provide insurance for staffers who work at least 30 hours per week. Guess Big Bird can try the exchanges, just like every other part-time employee at Sesame Place… what? No, it doesn’t matter that Big Bird isn’t real: the government isn’t checking exchange applications for fraud anyway. They’re getting quite the collection. Starting January 1st, 2014, people WILL be required to get health care. Or pay a fine. Starting January 1st, 2014, employers will NOT be required to offer people health care. Barack Obama gave them one year extensions, not individuals. A common theme of these letters seems to be that the plans are getting cancelled as of December 31, 2013. The new Obamacare health care exchanges are supposed to go up October 1, 2013. This means that the window of opportunity for these people to get a new health care plan in time to avoid gaps in coverage will be between October 1, 2013, and December 31, 2013. So all Barack Obama and the Democrats have to do is make sure that the exchanges are up and running on October 1, 2013, correct? Wisconsin labor union reform: saving jobs, money, schools. School districts that were able to institute Scott Walker’s & the GOP’s reforms to collective bargaining procedures have generally been able to balance their school budgets for the year without layoffs. In fact, at least one district that was on the verge of instituting layoffs will be able to avoid that. School districts that were not able to institute those reforms – for whatever reasons – will not be avoiding layoffs. I’m going to agree with Jen Rubin, here: the Left was not prepared to have a judge rule that Obamacare as a whole was unconstitutional. That courts were starting to conclude that the individual mandate was unconstitutional was something that people on the Other Side were beginning to get their heads around; that the whole thing thus had to be thrown out is still Here Be Dragons territory for that crowd. And that it was because the administration misplayed its hand by arguing too forcefully that the individual mandate was the keystone to the whole thing? Priceless. Meanwhile, let me join the rest of the blogosphere by admitting that from this point on it all comes down to what Justice Kennedy has for breakfast the morning the Supreme Court decides this one, and whether he liked it or not. Ach, well: it still beats, say, Egypt’s current method of resolving domestic political disputes. #rsrh OfA scared about House Obamacare repeal. To the point where they’re spamming their members* with dire, last-minute pleas to call up their Members of Congress and tell them that a pork-laden monstrosity that hasn’t had majority support for the last year or so is actually quite popular, really, no fooling. Two Republicans lost re-election last year. Both of them were in heavily-Democratic districts; one had never voted for or against Obamacare, and the other had voted both for and against Obamacare. Every other Republican voted against Obamacare, and every one of those Republicans who ran for re-election kept his or her seat. The Democratic party supported Obamacare last year. The Democratic party got eviscerated in the midterms last year. Those two facts are not unrelated. Virtually every Republican who ran last year ran on the concept of repealing Obamacare. The Republican party picked up a net 63 seats. Those two facts are not unrelated, either. All of this suggests that the House Republicans currently in office are not really worried about OfA, what it thinks, and whether or not OfA approves of the GOP’s plan to keep pushing repeal of the bloated monstrosity that is Obamacare. It’s nice to see that OfA is worried about House Republicans, though. Barney Frank calls Barack Obama dumb. (H/T Instapundit) Come, I will conceal nothing from you: I respect Barney Frank’s political skills. I absolutely can’t stand what he uses those skills for, but I recognize that Rep. Frank has them, and that he knows how to use them effectively. To give just one example, Rep. Frank was about the only Democrat to make it through last year’s August health care meltdown without looking like either an abject coward, or a purblind fool*. You don’t have to like him – and I don’t – to recognize that. #rsrh Caddell circles the Democrats. PS: By all means, Democrats: count your cash-on-hand and dismiss Caddell completely. Much obliged.